Trying to figure out when to take the GRE? This official guide lists GRE test dates for the 2017-2018 testing year. We’ll discuss the importance of planning when you’re going to take the general GRE. Plus, we’ll give you four important factors to consider when deciding on your GRE exam date. feature image credit: November/used under CC BY-SA 2.0/Cropped and resized from original. 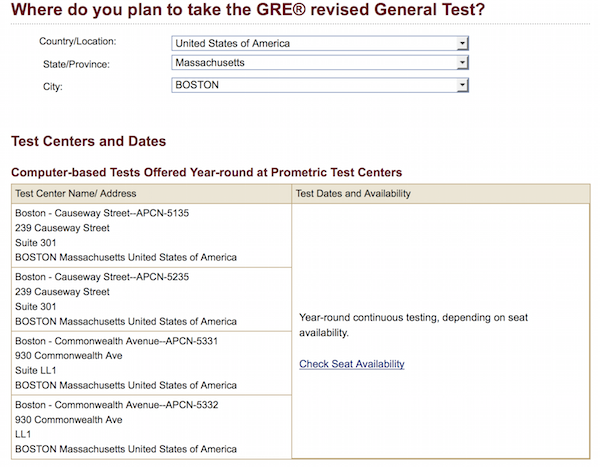 The computerized version of the GRE can be taken throughout the year at official Prometric® testing centers. There are also non-Prometric test centers that offer computer GRE testing. You can only take the computer-based general GRE once every 21 days and up to five times in one 365-day period, so you’ll need to be strategic about your GRE test-taking (more on that later). For all computer GRE tests (unless you’re taking it in China) you can see what dates are offered at a particular test center through the GRE test centers website. On the site, select your country, state/province, and city to see the availability of GRE test centers near you. For most computer-based testing centers you’ll see “Year-round continuous testing, depending on seat availability,” followed by a link labeled “Check seat availability”. Click on the “Check Seat Availability” link to go to another page where you’ll have to enter your address again and will then get a complete list of test centers near you (by distance); you’ll need to click each test center individually to see the GRE test schedule. We have a more thorough description (with images) of how to find out what GRE test dates are being offered at a GRE test center near you in our full guide to GRE test date choosing. #1: Computer- or Paper-Based GRE? For the most part, where you live determines which type of GRE you can take – some locations only offer the paper GRE, while others only offer computer-based GRE testing. Know which is the case for you and plan accordingly. If you live in an area where you’ll have to take a paper-based GRE, you’ll only have three chances to take it each year, whereas if you can take the computer GRE, there’s usually much more flexibility (and you don’t have to register quite as far in advance, since there are more dates available). In either case, try to register at least two months in advance to make sure you get the date and time you want. #2: Can you register online? If you need to apply for Monday GRE testing, disability or health accommodations, or a supplementary test center location, you’ll need to register for the GRE by paper, rather than online. This means that you’re going to need to leave extra time before the normal GRE registration date for your paperwork to arrive and be processed. While there is already an earlier registration date for paper registrations, it’s a good idea to get your information into ETS even earlier in case you need to make any alterations. How does this affect which test you choose? Let’s say that the October GRE test registration deadline is only a week away – you’ll probably be better off registering for the November or February GRE instead to give your registration materials enough time to get there and get processed. #3: How long should you study for the GRE? You don’t want to throw away your money on the GRE testing fee by taking it without any preparation, or not giving yourself enough time to prepare. Be sure to take a realistic practice GRE and determine what the test score standards are for the programs you’re applying to, then determine how much time you need to close the gap between the two (if there is a gap). #4: Do you know your application deadlines? Chances are you’re not just taking the GRE for fun – you’re taking it to apply to some sort of program (whether it’s graduate school or some other post-collegiate program). When you’re planning out your GRE schedule, you’ll need to know when the programs you’re applying to need to receive your scores by. Don’t take the GRE so close to the application date that you don’t have time to retake it if necessary (or, worse, so close that the program won’t receive your scores). Give yourself at least 4-6 months before your application deadline to take the GRE. Most of the United States offers computer-based testing only (with the exception of places like American Samoa and Guam). But if you live in an area of the world where there are no computer GRE test centers, you’ll have to register to take the paper-based general GRE test. You can take the paper general GRE as often as it’s offered (unlike the computer-based GRE test), but there are also stricter registration deadlines. Based on past years’ test dates and deadlines, we’ve projected the general GRE test dates and registration deadlines for 2017-2018. Please be sure to read the notes about projection accuracy further on in the article. In the tables below, you’ll see the GRE schedule for the testing year 2017-2018 listed by date and location. The dates when a test center offers the GRE are marked with a “Y” – if there’s no Y, then the test center won’t offer the general GRE on that test date. For the most part, these test dates should be correct. Like with all future events, however, there might be some changes as the dates get closer. A test center might shut down due to inclement weather, or a test center might open up that isn’t yet on the list. 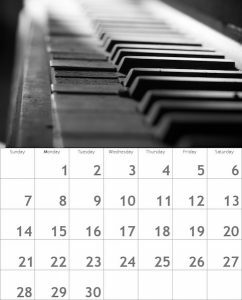 If the dates are off, they’ll be off by exactly a week – so at the very least, you can plan on taking the paper-based GRE in October or November of 2017 or February of 2018. Plan using the dates above and, within a year of the planned test date, check with the ETS website for official dates. As long as you’re not betting your life on it, the above dates should give you a good idea of future GRE exam dates. Need to know when you’ll get your GRE scores by? Find out how long it takes to get GRE scores and how the GRE is scored. It’s important to have a target GRE score in mind when preparing for the GRE. What’s the GRE score range like? Follow along as we analyze the average GRE scores as well as the highest possible and lowest possible GRE scores. What if you want to take the GRE right away? Learn about the GRE registration process here. I want to that where in India gre subject test in physics is going to held in 2017-1018. I want to know that where in India gre subject test in physics is going to held in 2017-1018. When does ETS release the test dates and centers for 2017? Next Next post: What’s the Lowest Possible, Minimum GRE Score?